From the Modern Radio Labs catalog, September 1979. 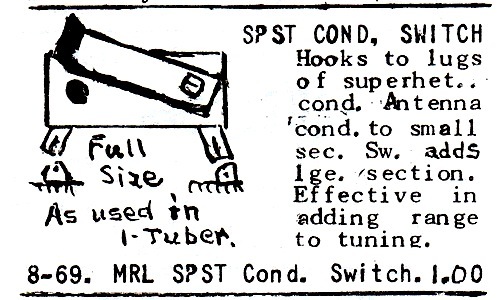 Elmer had crossed this item out because he no longer made them. When Elmer could no longer get the tube bases to make his coils, he made the bases himself. Later on this site we'll see that it once took him an entire day to make one set of six. 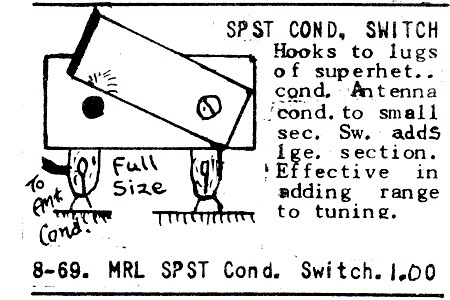 This enlargement shows a switch lever. Though it's enlarged, you still can't tell what it is. Elmer didn't use perspective or draw anything at an angle. In this case we are looking at it sideways. 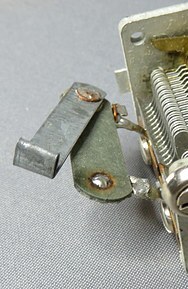 The switch lever is mounted to a panel and we can see both the front (left) and the rear of the lever. 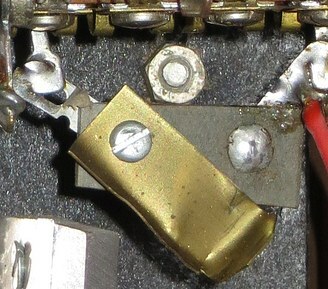 The switch lever in use. 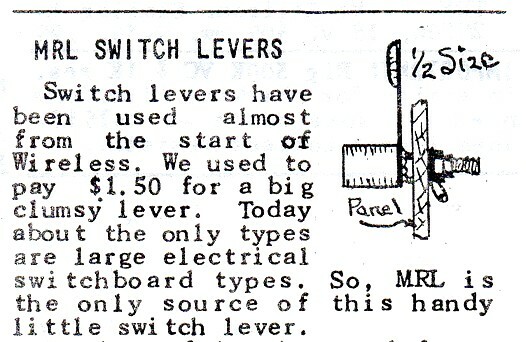 It's not just a lever, it's part of the switch. 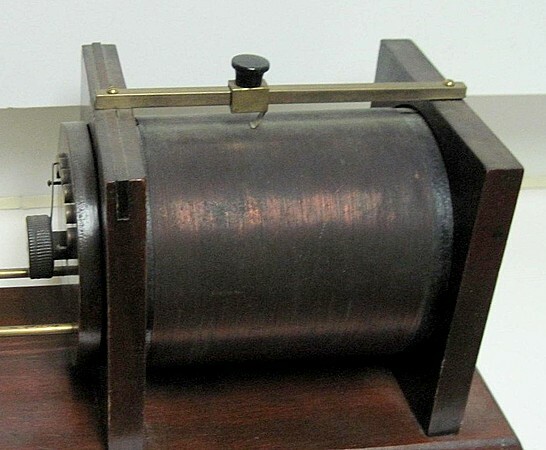 In this application it is selecting the taps on the coil of a MRL No. 2 crystal set. 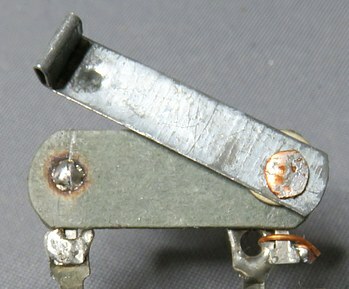 If a rotary switch were used here, the clicking of the switch would knock the cat whisker off the hot spot on the crystal. 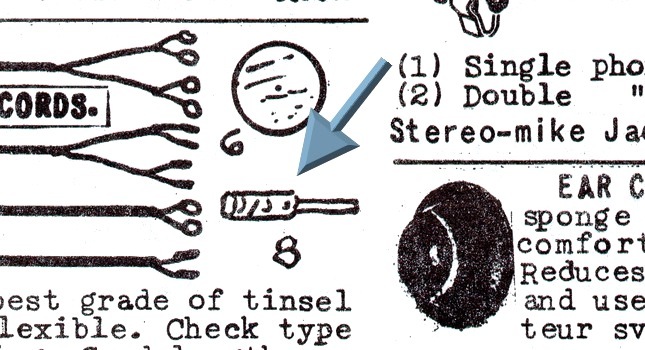 This drawing in the catalog looks pretty much what the actual slider looks like. 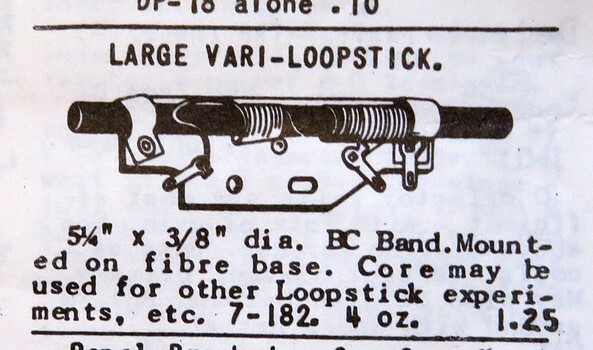 In 1979 the slider was 25¢, the rod was 10¢ and Elmer would drill the holes in the rod if you wanted for 5¢ per hole. Elmer provided instructions somewhere in his documentation to make almost everything he sold. 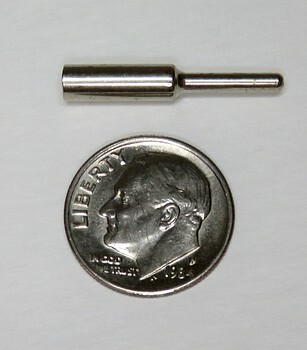 The slider on the right is made of five different parts. 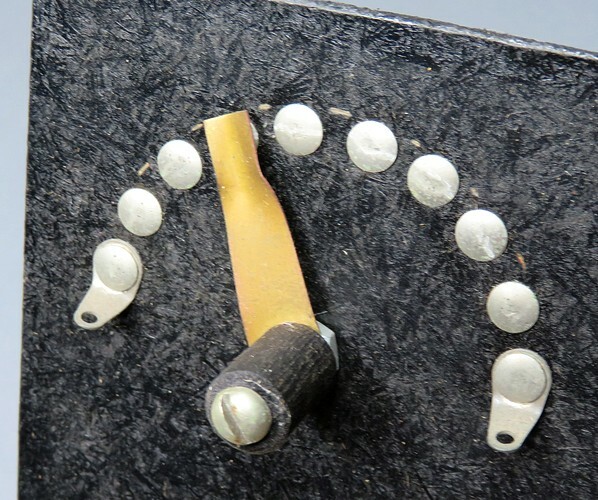 Do you want to find all the materials and make one yourself, or just order one from MRL? Considering what went into the construction of the slider, 25¢ was a great deal even in 1979! 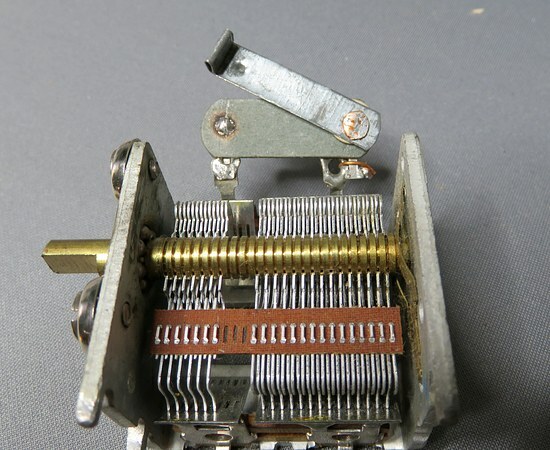 Coil sliders were used to select a winding on a coil in order to tune it. 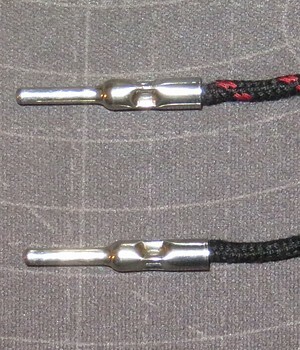 A commercially made one is shown above. 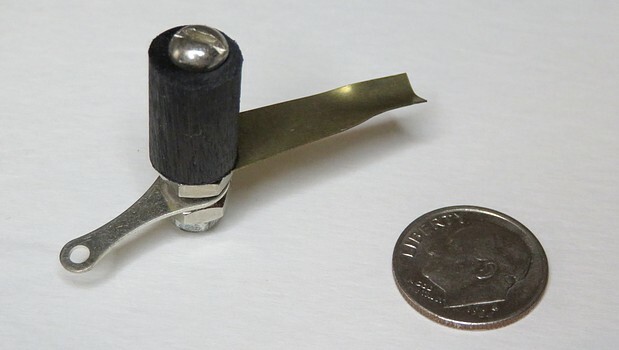 What's this, a lint roller? Screwdriver? Should we order some? They are only 5¢. 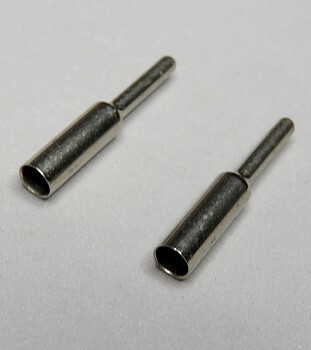 They are the tips for your headphone cord or anything else you want to plug into your radio. This drawing was obviously not made by Elmer. Doesn't match the picture but this came from MRL. By the 1980s this was no longer available. 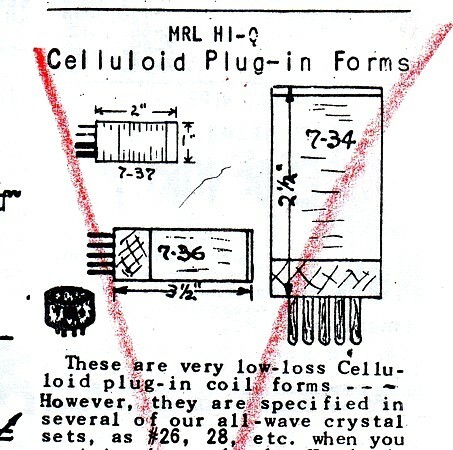 MRL "DATA SHEETS" Vol 1, pages 2 and 3 show two circuits using this coil. on the front panel for this purpose. 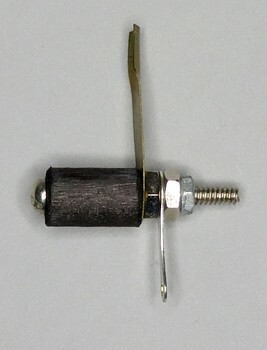 Elmer's method doesn't add any inductance in the form of extra wires. In 1969 Elmer and Mabel (and MRL) lived at 12041 Sheridan Lane in Garden Grove, California. In the 1970s MRL was at 10322 Ballard Drive in Garden Grove.